Finally I manage to test my tank water. It's about 7 the alkalinity may go up, will check again next week. Grow beds are new so its unstable. If alkaline goes up then I will add vinegar like distilled malt vinegar or apple cider, can't be harmful to fish and plant since its organic. Test kit above, requires 5 ml of tank water with 5 drop of test fluid. 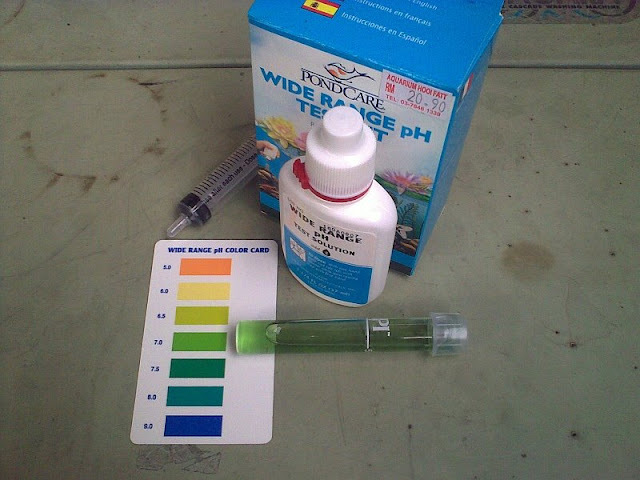 A color chart is provided to check pH value, its idiot proof. I use syringe to get the exact amount of water into the test tube. Will get the ammonia and nitrite test kit next. BTW Someone suggested to pour Guinness into the grow beds, he say Guinness have a lot of iron this may help provide iron to the plants. Anyone can confirm this... the Irish may have something up their sleeve with aquaponics I guess. Interesting suggestion, will the fish get drunk ... :) I wonder. I was in Dublin for a few years of my life, its a beautiful place and very friendly people. Did you ever get a confirmation on the Guiness? I've hung a rusty old chain into the side of my tank and buried a few rusty nails in my GBs. My understanding is that unchelated iron can be aborbed by plants, but only at the right PH range. Iron apparently has a pretty tight PH range in which it can be absorbed freely (unchelated). Chelated iron, on the other hand, can be absorbed in a much broader range. Unfortunately, I cannot get chelated iron where I am at. Any ideas on how to chelate it? No confirmation on Guinness, since I use scrap iron which is far cheaper. On how to chelate it, beats me, I think its more of a chemical process to produce such compound.